Having music in public domain, means that anyone –literally anyone– could take on P. Ramlees classic songs and make it their own, adding modern twist and turns where necessary, without paying a single cent in royalty. It’s the reason why anyone could play classical music from Beethoven and Bach openly and freely without worrying about copyright infringement, simply because the music of Beethoven and Bach are no longer copyrighted, they exist in public domain. This is of course the part of copyright law, very few people are familiar with, and there’s good reason why. Copyright law has for the last half century been focused on the rights of the copyright owner neglecting the essence of any law–public interest. By putting the ownership issue at the forefront of any copyright law discussions, lawyers and politicians have forgotten what copyright law was really meant to do, strike a balance between public interest and private ownership, it was never meant to exclusively protect copyright ownership. Can you imagine, what todays Malaysian artist could do to classics from P. Ramlee , how they could add and infuse modern twist to songs that are inherently part of our culture and heritage–without paying a single cent for copyright. At the risk of sounding crude, if white Guys are playing P. Ramlee songs on Youtube, imagine the music that we’d get from local artist, and more importantly what even amateurs could do from the recordings in their home–and publish their works freely without the threat of legal action. You may not feel comfortable with the phrase “not paying a single cent”, so let me elaborate. Firstly, a lot of independent Malaysian artist aren’t well funded anyway, although they may be ming-blowingly talented. I’m talking about the countless Indie artist who sell their music at the-wknd.com, these guys can’t afford to pay for the copyrights of songs, its only a small fraction of local artist that can sustain themselves purely from music. Secondly, a lot of people have the mis-conception that copyrights belong to artist. While that may be true for some cases, in most cases the copyright is owned by a big giant profit sucking corporation. The copyrights to the works of P. Ramlee isn’t owned by his family, but by a company called the Shaw Brothers, and his family had to literally beg for a tiny chunk of that profit , to the extent of seeking help from the federal government. This also explains why, even though the copyrights to P. Ramlees works brought in nearly Rm200 million, UMNO Youth had to help his daughter-in-law pay the Assesment arrears for his house in KL (amounting to less than Rm6,000). So forgive me if I don’t feel like paying a single cent to the Shaw Brothers, once the copyright for the works of P. Ramlee legally expires in 2024. Now 2024 sounds like a far off date, and it is, but a soon to be signed agreement between our Government and the Governments of several other nations could see the 2024 date, postponed to 2044, and who knows probably indefinitely. This new agreement is called the Trans-Pacific Partnership(TPP) agreement, and the unreasonable extension of copyright expiry dates is just one of the MANY MANY problems associated with the agreement. 1) The details of the TPP is as-yet undisclosed and has never been debated in the Malaysian Parliament. TPP negotiators have also been sworn to secrecy. 2) Members of Parliament requesting more information on the TPP have been denied access to the required documentation. 4) The 3 points above, point to single conclusion. The Government will be signing a legally binding agreement without first debating it in Parliament or allow for a public Referendum, this agreement will also super-cede all local laws and regulations specifically those related to Intellectual Property thereby granting power to a select few to amend the laws of this country. 4) Several other countries including Chile, Japan and Australia have begun to question the high cost of complying with the obligations in relation to the perceived benefits. 5) The TPP will significantly increase the cost of medication, not just in Malaysia but throughout it’s member countries, putting a huge swath of the lower-income at risk of not receiving the required medication. This is of course a by-product of the Intellectual Property regulations the TPP would introduce. 9) The US is pushing for internet termination as a accepted penalty for copyright infringement, policies to prioritize copyright enforcement over actual criminal enforcement and allowing copyright holders to ban parallel imports, meaning book publishers could ban the import of cheaper 2nd hand books to Malaysia from overseas. Parallel imports are more colloquially known in Malaysia as the ‘under-water market’, where some folks buy mint new gadgets and gizmos from abroad and selling them locally before their launch date here. Think of all the new iPads and iPhones that arrive from Singapore before the Malaysian launch date, think of my Kindle that I love so much–all of that illegal. 10) Finally the agreement would see the works of local artist (and artist from signatory countries) remain out of public domain for the foreseeable future. This of course leads me to my next point. The TPP reeks of evilness and yet most Malaysians are unaware of its existence let alone the fact that we’ve speed-railed ourselves into signing the deal. 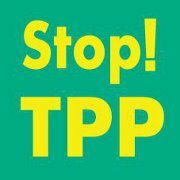 So in spreading the word about the TPP and the ridiculous obligations it will cast upon Malaysia, I started a small facebook page to spread the word and create awareness of the TPP. I call it Malaysians Against the Trans-Pacific Partnership Agreement, and it’s sole aim to to create awareness among the general population (specifically Facebook users) on the issues and implications of the TPP. Please visit the facebook page here, and ‘like’ the page to voice your concern regarding the agreement. There’s also a lot more content on the Facebook page. You can read the leaked copy of the TPP here, check out the Japanese StopTPP facebook page and learn about a Toilet Paper Protest against the TPP in the US. They are at it again, aren’t they? If this is true, SOPA ++ by any other name… is actually even worse than SOPA, killing creativity, killing enterprise, and with the drugs… just killing. literally. Yeap, they’re at it again Taufiq. However, I’ve read in the news recently that the Ministry of Health is voicing objections because it would raise the cost of medicines in Malaysia. Will write about it when I learn more. sorry for asking, let say we want to make a local brand for p ramlee, we should ask permission first right? so who is the right person?